The pigs are fresh off the embroidery hoop! Adding the grass seemed to make sense to me (I decided against mud quickly), so there it is. Next will be the giraffes. 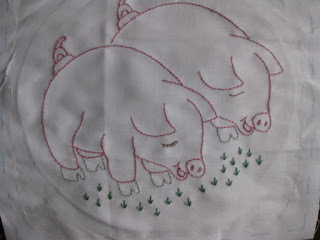 As I embroider, I feel calm and relaxed. Seating on a comfortable chair in my bedroom, feet resting on the ottoman, I take turns dreaming of the little grandchild who is coming next month, and listening to music or an audiobook. My motherly [nagging] instincts are on overdrive, as Michael and Daniela finish school, have a baby, and get ready to move away. I find myself picking on Michael's haircut (or lack thereof), his choice of jeans, barefoot on a cold day... What is going on with me? I don't want to drive him away with stupid comments! And yet, just as I was writing this post, Michael called me to talk about some funny thing that happened to him today. We have had this connection for as long as I can remember. He wants to speak with me, I call him. I wonder about how he is doing, he calls me. Even when he was away from the country... But I digress! For those of you who have missed the previous blocks I embroidered, here are the elephants, and here are the horses and snakes (or worms). Lastly, the Beat the Winter Blues Blog Hop hosted by Quilting Gallery has over 200 blogs participating, including this blog (see previous post here). Enter to win cool giveaways from all over the world!